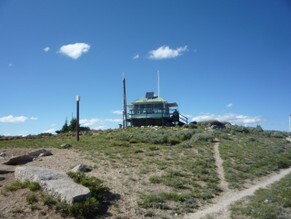 The Boise National Forest invites you out to the spectacular and wonderfully remote Bear Valley for the 2016 rehabilitation of the historic Whitehawk Fire Lookout! The lookout sits atep Whitehawk Mountain, and was constructed by the Civilian Conservation Corps (CCC) in 1933. The structure has been determined eligible for inclusion on the National Register of Historic Places (NRHP), and is a representative example of Forest Service, fire-related resources constructed during the New Deal-era. The lookout is of a standard plan and retains its historic integrity, despite minor alterations and its near constant use since construction. However, time and the elements have taken their toll on this national treasure, and we need your help to give Whitehawk Lookout a much-needed facelift!